Have any of you been to Rome? You have?! Oh man, am I jealous. I may have been to 34 countries, but I still haven’t managed to walk through the ancient streets of Rome, despite the fact that apparently all roads lead there. 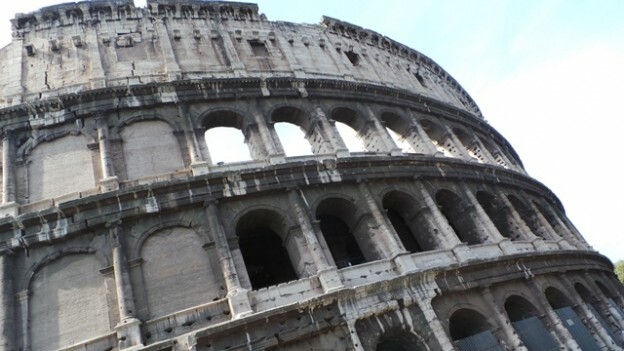 A year ago, I said I wanted to visit 15 European Destinations in 2015, and I am determined to visit Rome as soon as possible. It is such an iconic city, packed with history, beauty, intrigue and pizza. What’s not to love? In preparation for my future trip, I did a little internet surfing, and I’ve come up with my definitive bucket list for when my travels eventually do take me there. This one has to be at the top of my list. Not only is it one of the most awe-inspiring buildings in the world, but let’s face it, it’s pretty cool, and a stark reminder of the city’s brutal and bloodied past. With sounds of gladiatorial battles still ringing inside the walls of this grand arena, I can’t wait to stand in the centre of the 50,000 seats and wonder what it was like to be pitted against wild animals… hopefully no one will be there to give me the thumbs down. Rome was one of the greatest civilisations in human history, and you don’t build an empire without acquiring quite a few spoils of war. Everywhere you look it seems like there’s an intricate sculpture, a towering stone monument or a priceless piece of artwork. The Vatican Museum, St Peter’s Basilica, the Roman Forum and the Pantheon are all on my list. I wonder if I can rent chariot to take me around? This is possibly a once in a lifetime opportunity, as I travel so much that I rarely end up in the same place twice. How can you visit opera’s country of birth and not take the time to see one in a genuine Roman theatre? Plus, they’re really easy to plan for, as you can see which shows are currently on and buy Rome opera tickets online. I love doing things that are more off the beaten track, and I’m not afraid to explore the unchartered territory of most cities. When I heard that a big Roman past-time was visiting the tonnes of antique, vintage flea markets, I felt like booking my flight. The word on the street is that the biggest flea market in Rome is the Porta Portese. It’s only open on Sunday mornings, but this is the place for you if you want thousands of stalls with the most unusual offerings.